This segment is largely dominated by two large domestic players – Ashok Leyland and Tata Motors – who have a combined market share of 78 percent. Ashok Leyland once again maintains its leadership with an overall market share of 41.2 percent. The company has sold 16,323 units in FY2019 and gained 3.2 percent market share YoY. Tata Motors, which is a fierce competitor for the leadership, saw flat growth and sold a total of 14,447 units which gives it a market share of 36.4 percent YoY. VE Commercial vehicles, SML Isuzu and Mahindra & Mahindra are the other players in this segment with market shares of 10.4, 7.1 and 3 percent respectively. The heavy bus market is categorised into two large sub-segments – Mass exceeding 7.5 tonnes but not exceeding 12 tonnes and Mass exceeding 12 but not exceeding 16.2 tonnes. While Ashok Leyland leads in the overall bus market, each of the two sub-segments are dominated by the market leaders. Ashok Leyland is the dominant player in the 12-16.2T category, where mostly private players and STUs are big customers, with an over 60 percent share. The Viking, Cheetah and 12M are the company’s tried-and-tested products in the segment. Tata Motors is a distant second with a 33 percent share. Similarly, in the 7.5-12T category, Tata Motors leads with a 41 percent market share with its Starbus and Starbus Ultra range of buses whereas Ashok Leyland has 21 percent market share with its Lynx range of buses. Like the heavy truck market, the Indian heavy bus segment is the second largest market globally behind China. Growing urbanisation, higher density of population and an increasing need for public transport services across cities and towns is likely to drive demand for buses in India. However, demand for the buses segment is still small as compared to the goods carrier segment. 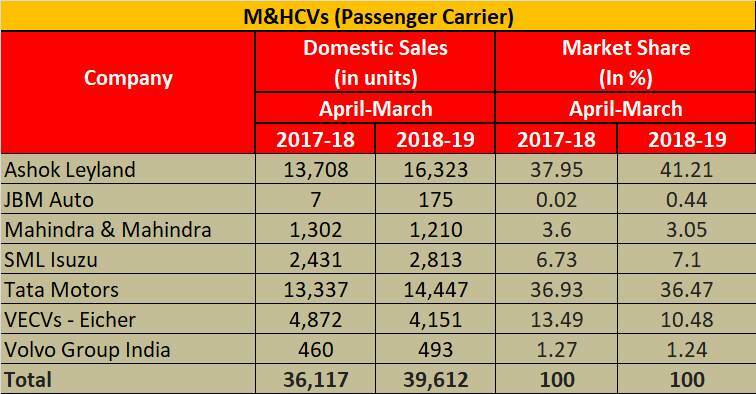 In FY2019 the total M&HCV truck segment registered total sales of 351,128 units, whereas bus sales were 39,612 units, a little above 10 percent of the number of trucks sold. Globally, in developed markets, the bus segment is between 35-40 percent of the total CV market, which is indicative of the high growth potential for buses in India. In the global bus market, India is behind China with a volume of 39,612 units sold last year. Europe as a whole accounts for about 30,000 units, Latin America 25,000 and Africa even less. The bus market in India is expected to grow over time, considering the average bus penetration is far below than what is essential for mobility needs of the country’s vast population. Historically, the Indian market has grown at an average of 9 percent between 2000-2012, after which the sales momentum slowed down until 2017, which meant the average growth rate of the total bus market from 2000-2017 was 4 percent. This may look moderate but given the overall size of the total bus market, this is sustainable for a long time.